The World vs.MS is a Sanofi Genzyme Europe initiative. 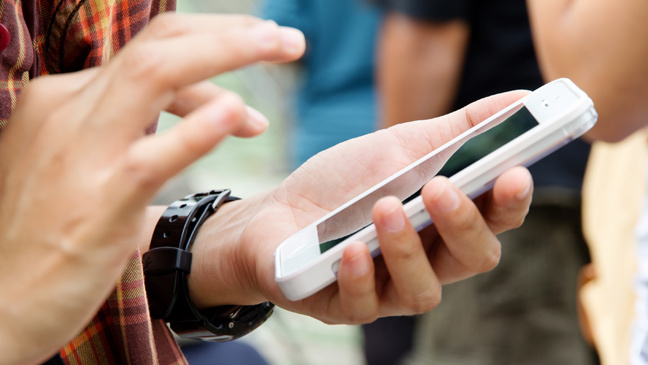 New digital technologies are taking hold in our lives apace. Everywhere you look, you see new ‘digital tools’ and other gadgets making the move from analogue to digital. Data, bills and all the other documents that were once on paper are now stored as electronic files. Instead of maps, we’ve got used to having navigation systems in our cars and many of us chat to Siri and Alexa on a daily basis. Our homes are becoming smarter and we’re switching our heating and lights on and off with the help of an app. But when it comes to living with a condition like MS, digital solutions can also bring about change for the better. Particularly in terms of healthcare, there are plenty of options available nowadays, some of which we’ll talk about below. Lots of us now own a smartphone. There are apps available for people with MS to help develop their cognition, remind them to take their medication, and even keep a journal to record daily events, such as their symptoms, pain, and any other relevant health issues. This isn’t just about collecting data for your own benefit, but can also provide your doctors with a better overall picture of you and your illness. The advantages are clear. The better and more comprehensively informed your doctors are, the better you, as a patient, can be informed, meaning better decisions overall can be made. But technology can also facilitate contact with doctors through what is known as remote medicine. Speaking with your doctors online has long been a matter of course in countries like Estonia, Sweden, France and some other regions like South Tyrol, which helps people who would otherwise have to travel long distances to see their doctors seek medical advice without so much effort. This saves money, by avoiding travel costs, but also time and, often, even the risk of catching a new illness. As we all know, waiting rooms in doctor’s surgeries are often overcrowded and teeming with viruses and bacteria that can quickly spread the common winter cold. For people with MS, that’s not very helpful at all. People who are immobile now have the opportunity to speak to their doctors, beyond their regular home visits, via remote appointments. These sessions can also help doctors take more regular heart rate readings and other vital measurements. Another new option is remote rehabilitation, which is about carrying out rehabilitation programmes online. Studies have shown that by using a PlayStation, for example, to play a variety of different games that all require different functions and actions, such as cognition and agility, patients can see positive results. People who exercise with these systems become more motivated to keep pushing forward. Teams from the Oklahoma Medical Research Foundation have also found that factors such as independence, quality of life and balance when walking are all positively impacted by remote rehabilitation programmes. These therapies are often more advantageous because patients are more motivated and energetic when they can avoid exhausting and strenuous journeys to and from therapy sessions in person. When it comes to information, the landscape is similar. How many folders do you have, as someone with a chronic condition? And how many gaps are there likely to be in your history, when it comes to your own health? I often need to update my doctors and medical staff about what’s happening with my MS. It can be a challenge. Time is limited, you may be nervous or upset, but all the information you’re providing needs to be as accurate as possible. Often, appointments are about planning the next steps, the next treatment options and recommendations. Accurate and complete information is vital in helping doctors and patients alike make the right decisions. But how can you sum up everything that’s happened to you over several years in such a short space of time? More often than not, it’s impossible. This is where digital patient records come in. They allow medical professionals to accurately enter your data and save everything in one place. Patients own the data and can share and manage it as they see fit with the experts. Digital patient files are not available in all European countries and are regularly discussed by both experts and patients. However, the advantages are clear. Based on the data collected, a more accurate picture of a disease can be built over time, enabling the big decisions to be made with greater clarity. Digital technology can bring about many advantages and many different solutions. Not everything is entirely perfect or available in every country yet, and digital solutions can sometimes go beyond what’s needed, but there are plenty of systems already in place that are helping people with a variety of illnesses. It’s important for us to be properly and fully informed so we can make conscious decisions with these tools. They certainly won’t replace one-on-one conversations with doctors, even in the long run, but they can certainly help to communicate more easily, to communicate more quickly and assess information properly and more accurately. 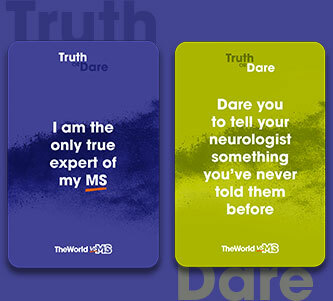 Discover your MS Truth and Dare yourself to do things differently with the Truth or Dare card game. © 2018 – 2019 Genzyme Europe B.V. – All rights reserved. The World vs.MS and Sanofi Genzyme are registered trademarks. Sanofi Genzyme is not responsible for the content of this external website. You are leaving to visit another one of our group websites. This website may be governed by different terms and conditions. Why did you find this content useful? Why didn't you find this content useful?